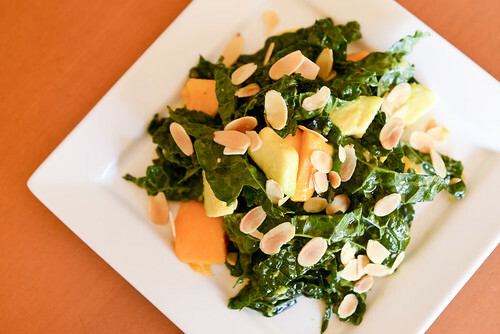 Moana Cafe has been a mainstay dining option in Paia for many years. 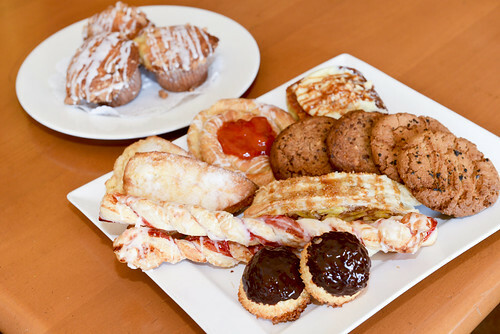 It’s known for their delectable pastries, breakfast-lunch-dinner schedule and nightlife. So when they closed last May, I was gravely disappointed. But my fears proved short lived when Moana re-opened a few weeks later under new owners David and Yulie Law. With its new look, the bistro now has a clean, stylish, urban vibe, like I just dropped into a Noe Valley cafe in San Francisco. The acoustics in the dining room reverberate so that conversations over the cement floors and the clanking in the open kitchen keep the room sounding lively. I like the new leather chairs and the high tops along the window–perfect for Paia people-watching from inside their climate controlled dining room. The Laws wasted no time putting together their dream team at the restaurant. 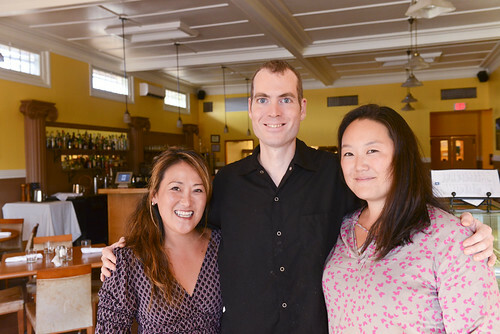 Helen Hong is the new manager, Lokelani Sribura is the baker, James Walworth is the chef and James Shoemaker is at the bar. 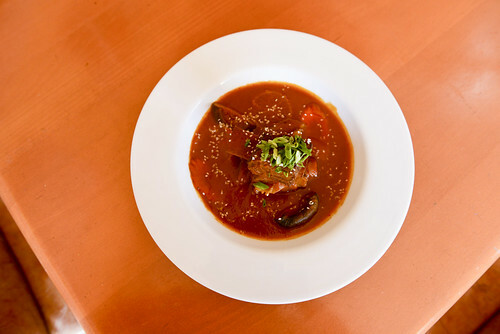 The menu went through a complete redesign, with family-style dining at dinner, and an added Asian flair with more focus on farm-to-table and share plates. Sribura bakes an array of pastries that you can get anytime from the case at the door. They also offer European pastries and American standards. But every time I’m there, the mac-nut sticky buns with cream cheese frosting fly out the door, and at dinner the Lilikoi cheesecake seems to appear on all the tables. Sribura says she graduated from the Maui Culinary Academy and continues to absorb tricks of the trade from her colleagues. Hong and Walworth both contributed family recipes to the dinner menu, making an innovative mix of share plates, sides and appetizers. It’s a build-your-own meal concept, with starters like puffed nori, salads, chicken sticks and the ahi poke tostada staving off hunger while you wait for the big share plates like Thai orange curry, Korean pot roast or tamarind pork ribs. The share sides feature lots of veggie options picked from the bounty of Hawaii farms: zucchini and onion, green beans, braised greens, kimchi and purple sweet potato. “Both my paternal and maternal sides of my family have a love of food, eating, cooking and experimenting,” says Hong. 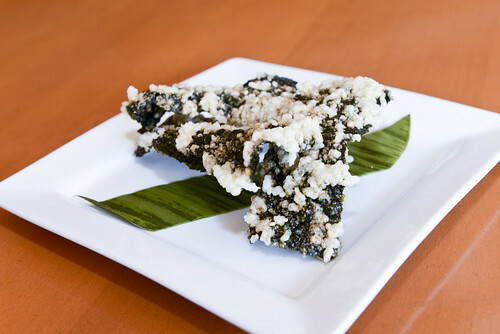 “The puffed rice nori came from an Aunt in Korea, as a gift only with instructions to fry until crisp and puffy. I had no idea what the result would be and was pleasantly surprised. My mother likes to play with flavors. She incorporates what is accessible in the US and applies it to Korean food. The kimchi we have at the restaurant is based on my mom’s basic recipe but with room and encouragement to experiment. For instance, instead of using Asian pear or apple to start the fermentation, we use pineapple, which results in a tangier kimchi. We also played with Daikon radish kimchi with orange juice and zest and are always looking for the next vegetable to kimichi. The resulting dinner meals you can put together at Moana could be different each time you go. The puffed rice nori is one of the most unique dishes I’ve tried, and the kids at our table loved it so much that we had to order it twice. The seasoned seaweed sheets are somehow battered and deep fried as crisp as a potato chip. Their breakfast menu stuck to the homestyle favorites and offer no surprises. Starting at 8am, you can get home fries, eggs, pancakes, French toast, omelets with fresh veggies and savory meats, loco moco and Eggs Benedict (breakfast is served until 2pm). For lunch, there are healthy standards, salads, soups, Saimin, wraps burgers and sandwiches. 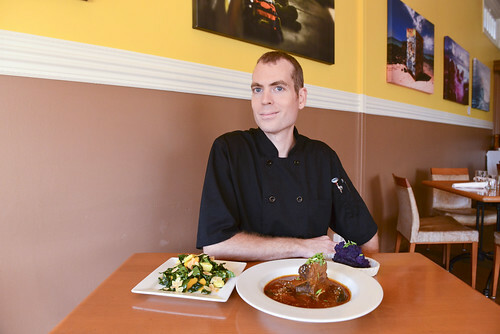 Chef Walworth says his most popular dishes are the ahi poke tostada, pork ribs flavored with tamarind and cinnamon, a salad of papaya and avocado tossed with ribbons of lacianato kale and the curry. The Laws are excited to be a part of the Paia scene. They hope their philosophy at the restaurant will serve them for years to come.